No one wants to take out the trash. No one wants to replace the liner. Yet there?s no reason why your trash should have to look shabby. A basic necessity in all homes, bedrooms and offices, your rubbish bin can make your undesirable waste have a clean and stylish appearance. Want a bit of glitz to hide your bathroom?s horrors" Buy a smooth copper bin to grace the tiled floor. Have a messy child (or spouse) constantly cluttering the kitchen" Drop their food into a sleek can complete with foot pedal. De-clutter, clean and re-organise your kitchen, bathroom or office space with our stunning, stylish ? and sometimes just plain fun ? selection of trash cans. 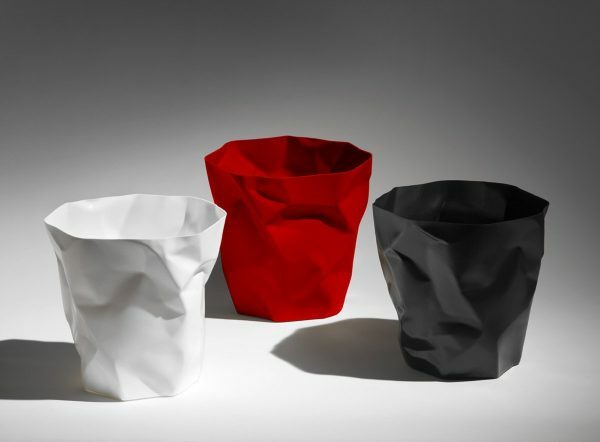 Crumpled Waste Basket: Designed by John Brauer, these polyethylene bins look just like your crumpled paper does inside them. Choose from black, white or red for a surprising find beneath your office desk. Plastic Trash Can With Marble-Like Finish: Want a marble bin, but can?t quite afford it" This plastic find with marble finish is easy on the wallet and easy on the eye. A spot in a marbled bathroom would be quite the fit.